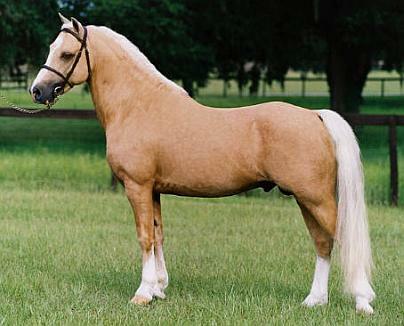 The term Palomino does not refer to a specific breed of horses but to a type of color. The Palomino coloring is evident in a number of breeds. There are various theories where the name Palomino comes from, one suggests that it comes from Juan de Palomino who received a golden colored horse from Cortes. The origin of the Palomino is not clear as golden colored horses are found all over the world. Works of art dating back many centuries depict such horses in Asia, Japan and several European countries. The Spanish Queen Isabella encouraged the breeding of golden horses, as a result in Spain they are often referred to as Isabellas. In North America Palominos were imported by the Spanish Conquistadores. This type of coloring is believed to come from Arabian horses. Breeds with Palomino coloring include the Welsh Pony and Cob and in the United States they include Morgans, Quarter Horses, American Saddlebreds, Arabians, and Tennessee Walking Horses.